NASA's newest communications satellite blasted into space tonight (Jan. 23), beefing up the network that links ground controllers to the International Space Station and Earth-orbiting research observatories. The 3.8-ton TDRS-L data relay satellite lifted off at 9:33 p.m. EST tonight (0233 GMT Friday) from Florida's Cape Canaveral Air Force Station, its Atlas 5 rocket lighting up the night sky with bright-orange flame as it climbed toward space. 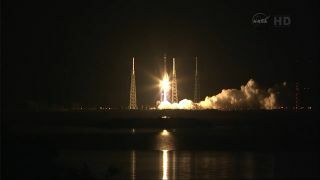 "The TDRS constellation brings back all of the data and video that we see every day from the International Space Station," NASA launch director Tim Dunn said in a statement. "TDRS also supports all of the data from the Hubble Space Telescope and all of our low-Earth orbit NASA science missions." The TDRS program began taking shape in the early 1970s, as NASA sought a better way to stay in touch with its orbiting spacecraft. At that point, the space agency relied on a system of ground stations, each of which could receive and send data only when a satellite passed nearly overhead. The first TDRS spacecraft launched in 1983, and NASA has been maintaining and upgrading the system ever since. The roughly $360 million TDRS-L will join eight currently operational satellites in the network, all of which orbit at an altitude of 22,300 miles (35,888 kilometers). These numbers offer some redundancy for the constellation, which was designed to work with six satellites and one "hot spare," TDRS program officials said. NASA and its industry contractors have developed three different generations of TDRS satellites over the decades. The first generation included seven spacecraft, which launched between 1983 and 1995, while three second-generation satellites blasted off from 2000 through 2002. The third generation also includes three spacecraft, the first of which, TDRS-K, launched in January 2013. The other two in this class are TDRS-L and TDRS-M, which is slated to be ready for liftoff in 2015. The TDRS constellation has proven its value over the years, NASA officials said. The satellites mostly support NASA missions, but they relay data from spacecraft run by other government agencies as well. "Not only are we getting global coverage 100 percent of the time, we are getting it in real time," Badri Younes, NASA's deputy associate administrator for space communications and navigation, said in a prelaunch press conference on Tuesday (Jan. 21). "Without such support, we'd have to live with very limited coverage, around 10 to 15 percent," he added. "No human spaceflight program can be supported at this data rate, and even our ability to respond in real time to emergency would diminish drastically. That's why TDRS has been declared as a national asset." TDRS-L, which was built by Boeing, will undergo several months of on-orbit checks before being cleared for use and officially handed over to NASA, officials said. While the satellite was designed to last for at least 15 years on orbit, most TDRS spacecraft have lived considerably longer than that.